From the Hancock County Courthouse, go northeast on Hwy 16 for 0.3 mile to the fork at the Sparta Baptist Church. Stay left on Hwy 16 and go east for about 3.9 miles. The church and cemetery are on the left. Graves numbered 150 or higher have been added since the original survey and are based on obituaries. 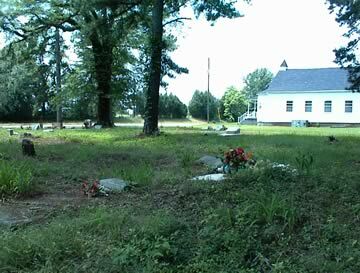 They are believed to be somewhere in the cemetery. We Love You ... Children and Grands. "Father" "He died as he lived, a Christian"